Parasitic species of moist to mesic forests. Distinctive totally white plants with a solitary white flower, turning black as it ages. 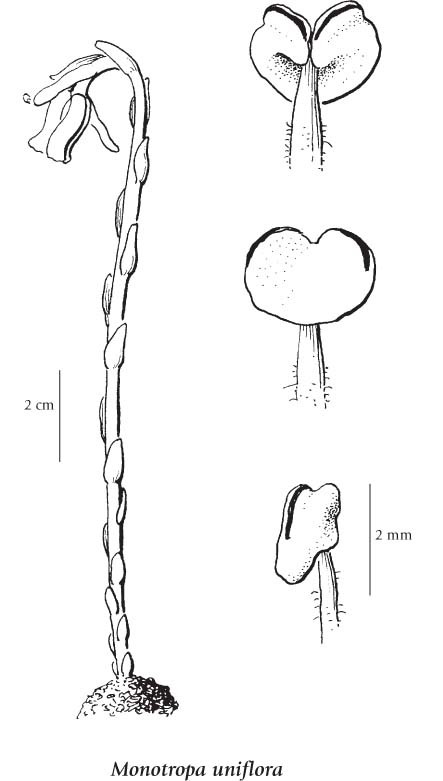 Perennial herb from a fleshy root mass; parasites on mycorrhizal fungi associated with trees; "stems" many, erect, simple, 5-30 cm tall, waxy-white, blackening with age; persistent after seed dispersal; without chlorophyll. Scale-like, linear or lanceolate to egg-shaped, up to 10 mm long; entire or somewhat wavy-margined. Inflorescence a terminal, solitary flower, curved to one side or even drooping, becoming erect in fruit; calyces and corollas similar; corollas narrowly bell-shaped, 15-20 mm long, the petals 5, pouch-like at the base, oblong spoon-shaped, more or less hairy within; calyces of 2 to 4 bract-like sepals or lacking; stamens shorter than the corolla; styles 2-5 mm wide; stigmas discoid-lobed. Capsules, erect, nearly globe-shaped, 5-7 mm long. Stem and leaves can be considered part of the inflorescence. Mesic to moist forests in the lowland and montane zones; frequent in extreme SW BC, infrequent in SC BC, and rare in C BC; N to SE AK, E to NF, and S to CA, MX, and FL; Central America; Asia. A shade-tolerant, submontane to montane, Asian and transcontinental North American saprophyte. Occurs on fresh to moist, nitrogen-medium soils in montane boreal, wet temperate, and cool mesothermal climates; its occurrence decreases with increasing latitude. Occurs sporadically in closed-canopy coniferous forests (most common on southern Vancouver Island and the Gulf Islands) on water-shedding and water-receiving sites. Characteristic of mycorrhiza-rich Mor and acidic Moder humus forms.